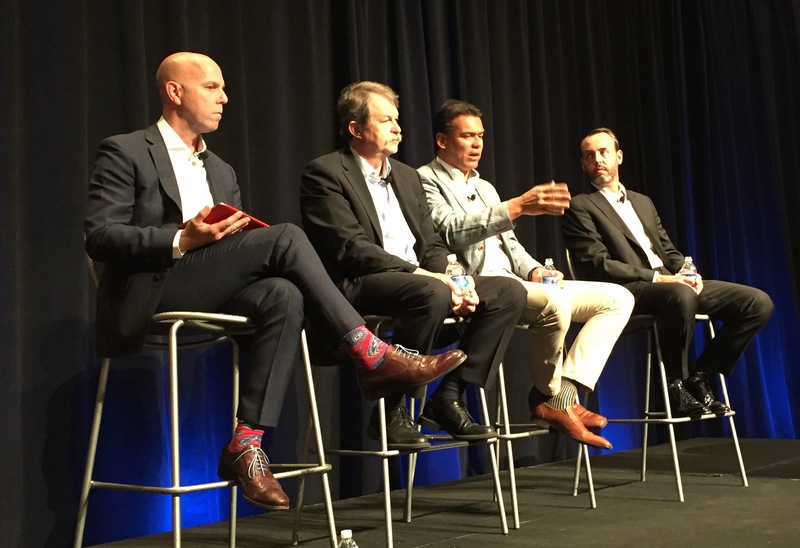 I finished up Pegaworld 2016 at a panel of Pega technology executives who provided the vision and roadmap for CRM and Pega 7. Don Schuerman moderated the panel, which included Bill Baggott, Kerim Akgonul, Maarten Keijzer, Mark Replogle and Steve Bixby. This is the last session on day 2; tomorrow is all training courses and I’ll be heading home. It’s been a pretty full couple of days and always good to see what Pega’s up to. I attended a breakout panel on how the idea and usage of personal data are changing was moderated by Alan Marcus of the World Economic Forum (nice socks! ), and included Richard Archdeacon of HP, Rob Walker from Pega and Matt Mobley from Merkel. It’s not enough to restrict values in a customer data set; it’s now possible to derive hidden values (such as gender or race) from other values, which can result in illegal targeting: how much efforts should be put into anonymizing data when it can be easily deanonymized? Food for thought. A lot of unresolved issues in personal data privacy and management. Day 2 of Pegaworld 2016 – another full day on the schedule. The keynote started with Gilles Leyrat, SVP of Customer and Partner Services at Cisco, discussing how they became a more digital operation in order to provide better customer service and save costs. Cisco equipment provides a huge part of the backbone of the internet, supporting digital transformation for many other organizations, but this was about how they are transforming themselves to keep pace with their customers as well as their competitors. They are using Pega to digitize their business by connecting people and technology, automating processes, and using data for real-time analytics and process change to support their 20,000-strong sales team and 2M orders per year. Their digitization has three key goals: operational excellence, revenue growth, and “delightful” customer experience. Customer experience is seen as being crucial to revenue growth, with strong causal links showing up in research. He compared the old world — offshore customer service centers augmented by onshore specialists — with the new digital world, where digitization is a means to achieving their customer experience goal by simplifying, automating and using analytics. By reducing human touch in many standard processes, they are able to reduce wait time for customers while allowing workers to focus on interacting with customers to resolve problems: 93% of cases are now handled with zero touch, saving 2M hours of wait time per year and reducing order resolution time to 6 hours. The employee experience is improved through integrated workplaces and actionable intelligence that support their work patterns. He ended with the advice to understand what you’re trying to achieve, and linking your digital transformation initiatives to those goals. Alan Trefler returned to the stage to introduce the concepts of the fourth industrial revolution and workforce disruption; he sees what is happening now as a step change in how society works and how we interact with technology. We heard from Alan Marcus, Head of the Technology Agenda at the World Economic Forum, on this topic, and how new categories of jobs and the required skill sets will completely transform employment markets. Lots of opportunities, but also lots of disruption, in both first world and emerging markets. He covered a timeline of changes and their impacts, and stressed that skill sets are changing quickly: 35% of core skills will change by 2020. Companies need to expose workers to new roles and training, and particularly open doors to women in all roles. Creativity will become a core skill, even as AI technologies gain acceptance. Governments and education systems need to innovate to support the changing workforce. 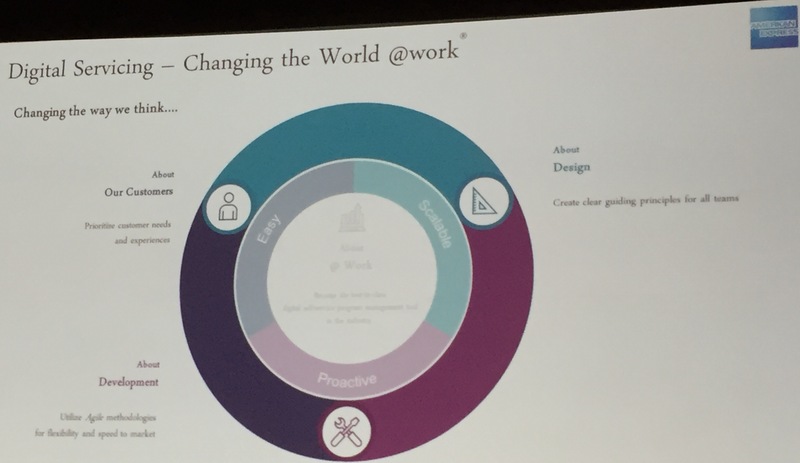 Organizations need to reinvent their HR to help employees to move into this brave new world. The keynote finished with Gerald Chertavian, Founder and CEO at Year Up, an organization that helps low-income youth prepare for a professional job. There’s a social justice goal of helping young adults who have no college degree (and no path to get one) to become hireable talent through practical training and internships; but there’s also the side benefit of feeding skilled workers into the rapidly-changing technology-heavy employment market that Marcus discussed earlier. Year Up was contacted by American Express, who needed people trained in Java and Pega in order to re-onshore some of their development work; they created a curriculum targeted at those jobs and trained up a large number of people who then competed successfully for those jobs. Year Up is now in 18 cities across the US, working with large organizations to identify skills gaps and train people to suit the employment pipeline. They’re changing tens of thousands of lives by providing a start on the path to upward mobility, and feeding a need for companies to hire the right skills in order to transform in this fourth industrial revolution. Less than two months ago, Pega announced their acquisition of OpenSpan, a software vendor in the robotic process automation (RPA) market. That wasn’t my first exposure to OpenSpan, however: I looked at them eight years ago in the context of mashups. Here at PegaWorld 2016, we’re getting a first peek at the unified roadmap on how Pega and OpenSpan will fit together. Also, a whole new mess of acronyms. I’m at the OpenSpan session at Pegaworld 2016, although some of these notes date from the time of the analyst briefing back in April. Today’s presentation featured Anna Convery of Pega (formerly OpenSpan); Robin Gomez, Director of Operational Intelligence at Radial (a BPO) providing an introduction to RPA; and Girish Arora, Senior Information Oficer at AIG, on their use of OpenSpan. Back in the 1990’s, a lot of us who were doing integration of BPM systems into enterprises used “screen scraping” to push commands to and pull data from the screens of legacy systems; since the legacy systems didn’t support any sort of API calls, our apps had to pretend to be a human worker to allow us to automate integration between systems and even hide those ugly screens. Gomez covered a good history of this, including some terms that I had hoped to never see again (I’m looking at you, HLLAPI). RPA is like the younger, much smarter offspring of screen scraping: it still pushes and pulls commands and data, automating desktop activities by simulating user interaction, but it’s now event-driven, incorporating rules and machine learning. As with BPM and other process automation, Gomez talked about how the goal of RPA is to automate repeatable tasks, reduce error rates, improve standardization, reduce requirement for knowledge about multiple systems, shorten worker onboarding time, and create a straight-through process. At Radial, they were looking for the combination of robotic desktop automation (RDA) that provides personal robots to assist workers’ repetitive tasks, and RPA that completely replaces the worker on an unattended desktop. I’m not sure if every vendor makes a distinction between what OpenSpan calls RDA and RPA; it’s really the same technology, although there are some additional monitoring and virtualization bits required for the headless version. OpenSpan provides the usual RPA desktop automation capabilities, but also includes the (somewhat creepy) ability to track and analyze worker behavior: basically, what they’re typing into what application in what context, and present it in their Opportunity Finder. This information can be mined for patterns in order to understand how people do their job — much the way that process mining works, but based on user interactions rather than system log files — and automate the parts that are done the same way each time. This can be an end in itself, or a stepping stone to a replacement of the desktop apps entirely, providing interim relief while a full Pega BPM/CRM implementation is being developed, for example. Furthermore, the analytics about the user activities on the desktop can feed into requirements for any replacement initiative, both the general flow as well as an analysis of the decisions made based on what data was presented. OpenSpan and Pega aren’t (exactly) competitive technologies: OpenSpan can be used for desktop automation where replacement is not an option, or can be used to as a quick fix while performing desktop process discovery to accelerate a full Pega desktop replacement project. OpenSpan paves the cowpaths, while a Pega implementation is usually a more fundamental innovation that may not be warranted in all situations. I can also imagine scenarios where a current Pega customer uses OpenSpan to automate the interaction between Pega and legacy applications that still exist on the desktop. From a Pega sales standpoint, OpenSpan may also act as the camel’s nose in the tent to get into net new clients. There are a wide variety of use cases, some of them saving just a few minutes but applicable to thousands of workers (e.g., logging in to multiple systems each morning), others replacing a significant portion of knowledge work for a smaller number of workers (e.g., financial reconciliations). Arora talked about what they have done at AIG, in the context of processes that require a mix of human-required and fully automatable steps; he sees their opportunity as moving from RDA (where people are still involved, gaining 10-20% in efficiency) to RPA (fully automated, gaining 40-50% efficiency). Of course, they could just swap out their legacy systems for something that was built this century, but that’s just too difficult to change — expensive, risky and time-consuming — so they are filling in the automation gaps using OpenSpan. 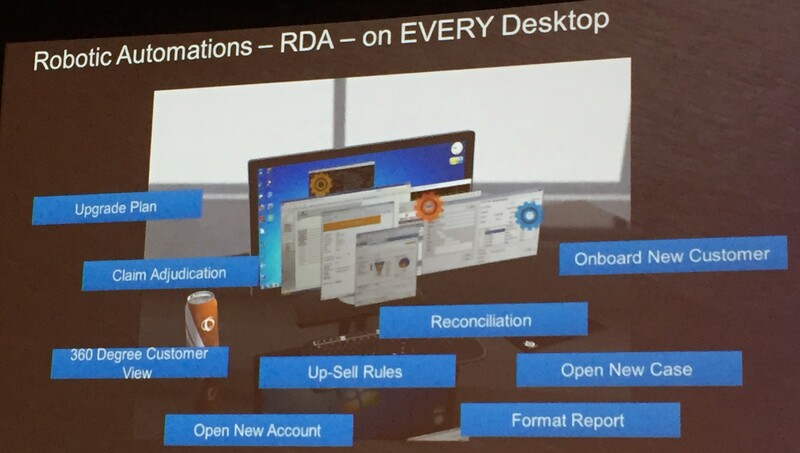 They have RDA running on every desktop to assist workers with a variety of tasks ranging from simple to complex, and want to start moving some of those to RPA to roll out unattended automation. OpenSpan is typically deployed without automation to start gathering user analytics, with initial automation of manual procedures within a few weeks. As Pega cognitive technologies are added to OpenSpan, it should be possible for the RPA processes to continue to recognize patterns and recommend optimizations to a worker’s flow, becoming a sort of virtual personal assistant. I look forward to seeing some of that as OpenSpan is integrated into the Pega technology family. OpenSpan is Windows-only .NET technology, with no plans to change that at the time of our original analyst briefing in April. We’ll see. It seems like I was just here in Vegas at the MGM Grand…oh, wait, I *was* just here. Well, I’m back for Pegaworld 2016, and 4,000 of us congregated in the Grand Garden Arena for the opening keynote on the first day. If you’re watching from home, or want to catch a replay, there is a live stream of the keynotes that will likely feature an on-demand replay at some point. 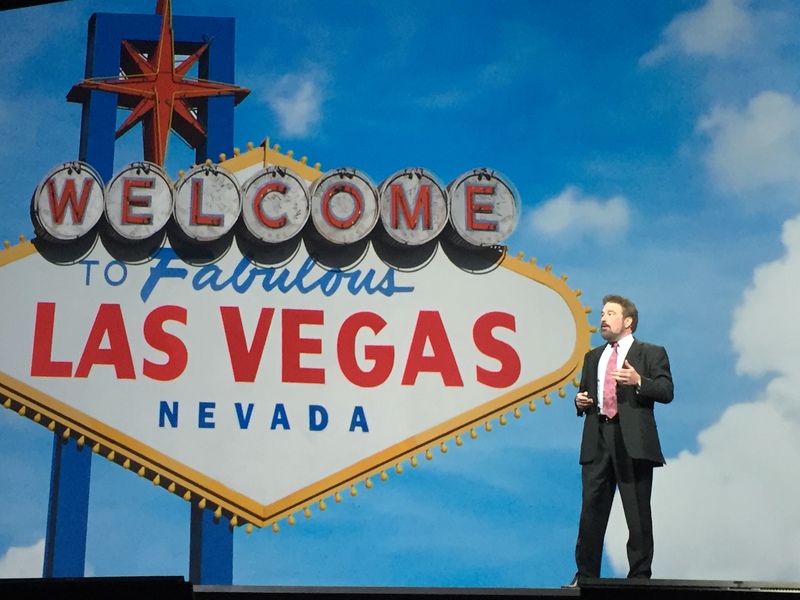 Alan Trefler, Pega’s CEO, kicked things off by pointing out the shift from a focus on technology to a focus on the customer. Surveys show that although most companies think that they understand their customers, the customers don’t agree; companies need to undergo a serious amount of digital transformation in order to provide the level of service that today’s customers need, while still improving efficiencies to support that experience. One key to this is a model-driven technology environment that incorporates insights and actions, allowing the next best action to be provided at any given point depending on the current context, while supporting organizational evolution to allow constant change to meet the future demands. Model-driven environments let you create applications that are future-proof, since it is relatively quick to make changes to the models without changing a lot of code. Pega has a lot of new online training at the Pega Academy, a marketplace of third-party Pega applications at the Pega Exchange, and the continuing support of their Pega Express easy-to-use modeler; they continue to work on breaking free from their tech-heavy past to support more agile digital transformation. Pega recently sponsored an Economist report on digital transformation; you can grab that here. Don Schuerman, Pega’s CTO, took over as MC for the event to introduce the other keynote speakers, but first announced a new partnership with Philips that links Pega’s care management package with Philips’ HealthSuite informatics and cloud platform for home healthcare. Jeroen Tas, CEO of Connected Care & Health Informatics at Philips presented more on this, specifically in the context of the inefficient and unevenly-distributed US healthcare system. He had a great chart that showed the drivers for healthcare transformation: from episodic to continuous, by orchestrating 24/7 care; from care provider to human-centric, by focusing on patient experience; from fragmented to connected, by connecting patients and caregivers; and from volume to value, by optimizing resources. Connected, personalized care links healthy living to disease prevention, and supports the proper diagnosis and treatment since healthcare providers all have access to a comprehensive set of the patient’s information. Lots of cool personal healthcare devices, such as ultrasound-as-a-service, where they will ship a device that can be plugged into a tablet to allow your GP to do scans that might normally be done by a specialist; continuous glucose meters and insulin regulation; and tools to monitor elderly patients’ medications. Care costs can be reduced by 26% and readmissions reduced by 52% through active monitoring in networked care delivery environments, such as by monitoring heart patients for precursors of a heart attack; this requires a combination of IoT, personal health data, data analytics and patient pathways provided by Philips and Pega. He ended up stating that it’s a great time to be in healthcare, and that there are huge benefits for patients as well as healthcare providers. Although Tas didn’t discuss this aspect, there’s a huge amount of fear of connected healthcare information in user-pay healthcare systems: people are concerned that they will be refused coverage if their entire health history is known. Better informatics and analysis of healthcare information improves health and reduces overall healthcare costs, but it needs to be provided in an environment that doesn’t punish people for exposing their health data to everyone in the healthcare system. We continued on the healthcare topic, moving to the insurance side with Birgit König, CEO of Allianz Health Germany. Since basic healthcare in Germany is provided by the state, health insurance is for additional services not covered by the basic plan, and for travelers while they are outside Germany. There is a lot of competition in the market, and customer experience for claims is becoming a competitive differentiator especially with new younger customers. In order to accommodate, Allianz is embracing a bimodal architecture approach, where back-end systems are maintained using traditional development techniques that focus on stability and risk, while front-end systems are more agile and innovative with shorter release cycles. I’ve just written a paper on bimodal IT and how it plays out in enterprises; not published yet, but completely aligned with what König discussed. Allianz is using Pega for more agile analytics and decisioning at the front end of their processes, while keeping their back-end systems stable. Innovation and fast development has been greatly aided by co-locating their development and business teams, not surprisingly. The keynote finished with Kerim Akgonul, Pega’s SVP of Products, for a high-level product update. He started by looking at the alignment between internal business goals and the customer journey, spanning marketing, sales, customer service and operations. 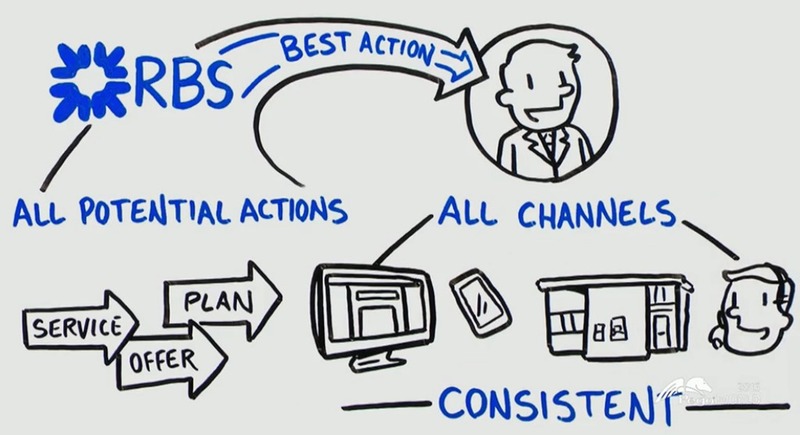 The Pega Customer Decision Hub sits at the middle of these four areas, linking information so that (for example), offers sent to customers are based on their past orders. Marketing: A recent Forrester report stated that Pega Marketing yields an 8x return on marketing investment (ROMI) due to the next-best-action strategies and other smart uses of analytics. Marketers don’t need to be data scientists to create intelligent campaigns based on historical and real-time data, and send those to a targeted list based on filters including geolocation. We saw this in action, with a campaign created in front of us to target Pegaworld attendees who were actually in the arena, then sent out to the recipients via the conference mobile app. Sales: The engagement map in the Pega Sales Automation app uses the Customer Decision Hub information to provide guidance that links products to opportunities for salespeople; we saw how the mobile sales automation app makes this information available and recommends contacts and actions, such as a follow-up contact or training offer. There are also some nice tools such as capturing a business card using the mobile camera and importing the contact information, merging it if a similar record is found. 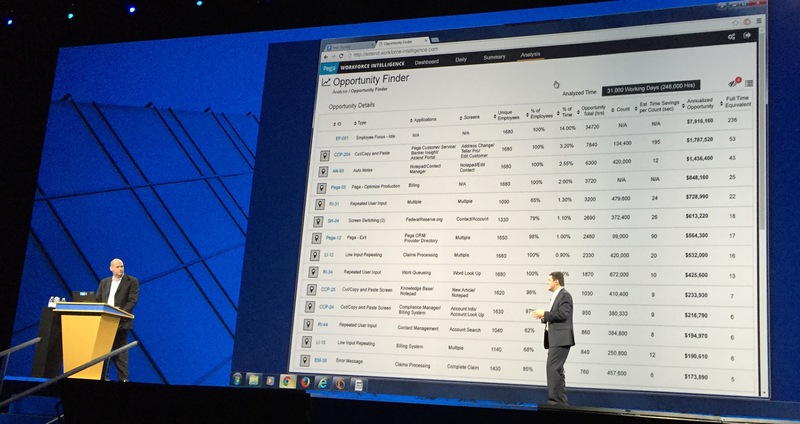 Customer service: The Pega customer service dashboard shows individual customer timelines, but the big customer service news in this keynote is the OpenSpan acquisition that provides robotic process automation (RPA) to improve customer service environments. OpenSpan can monitor desktop work as it is performed, and identify opportunities for RPA based on repetitive actions. The new automation is set up by recording the actions that would be done by a worker, such as copying and pasting information between systems. The example was an address change, where a CSR would take a call from a customer then have to update three different systems with the same information by copying and pasting between applications. We saw the address change being recorded, then played back on a new transaction; this was also included as an RPA step in a Pega Express model, although I’m not sure if that was just to document the process as opposed to any automation driven from the BPM side. Operations: The Pega Field Service application provides information for remote workers doing field support calls, reducing the time required to complete the service while documenting the results and tracking the workers. We saw a short video of Xerox using this in Europe for their photocopier service calls: the field engineer sees the customer’s equipment list, the inventory that he has with him, and other local field engineers who might have different skills or inventory to assist with his call. Xerox has reduced their service call time, improved field engineer productivity, and increased customer satisfaction. 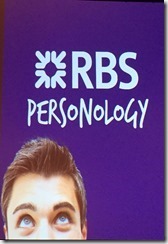 Good mix of vision, technology and customer case studies. Check out the replay when it’s available. Context matters. Analyze and understand the information about your customers and your interactions with them. Connecting customers to operations. Think of your customers’ actions online as part of your business process, and implement your processes accordingly. The rise of things. Specifically, the process of things: devices becomes actors in sense-and-respond processes, and channels for customer engagement, across the seven levels of the IoT World Forum reference model. Design time blurs with runtime. Model-driven development, and moving from explicit requirements collection to having the business make changes on the fly. The digital executive. Making it so simple that even a C-level executive can understand it. Or better yet, finding executives that actually have a digital clue. Two-speed IT. Setrag talked about mapping business KPIs and value streams directly onto case phases; being able to do this using Agile model-driven development while still doing more traditional maintenance on underlying legacy systems allows for fast-tracking strategic projects. The database is dead, long live the database. Moving from transactional SQL-based RDBMS to the new crop of NoSQL databases optimized for big data, analytics and more dynamic applications. Smart enterprises avoid the app-pocolypse. Allow for native apps as well as responsive web for the most flexibility. The hybrid cloud. Well, that goes back to what we can really call “cloud”. The rise of design. Users expect beautiful design; if you don’t live up to those expectations, you degrade the customer experience and therefore your relationship with them. He was joined by Adam Field from Pega’s technology innovation area to see some examples of what Pega is doing in mobile user experience and device management. 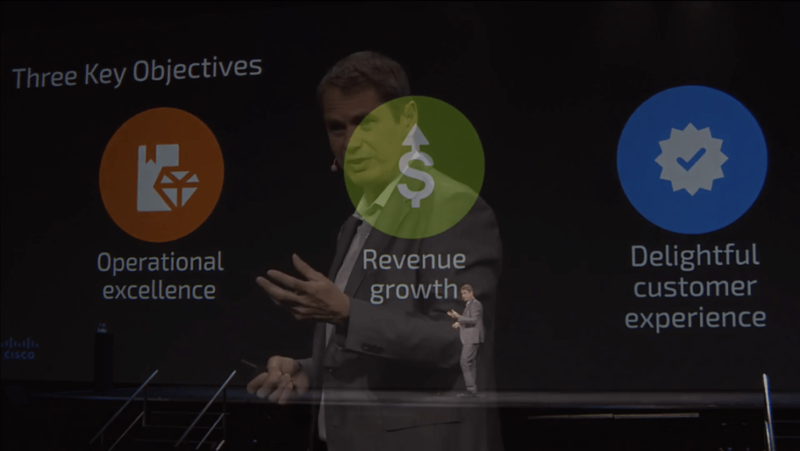 Fast-paced and fun view of what’s driving the digital enterprise, and a bit of how Pega is helping its customers meet those needs. That’s it for PegaWorld 2015: it was a quick but information-filled trip. I’ll be at the IRM BPM conference in London next week, then the BPM and Case Management Summit in DC the week following, watch for my coverage from those events. I attended a breakout presented by TD Bank (there was also a TCS presenter, since they’ve done the implementation) on their workflow system for customer maintenance requests – it’s a bit of a signal about the customer, and possibly the SI, that this is called “workflow” – and how they have implemented this using Pega. They started with PRPC 6.3 and there was no indication that they’ve upgraded to Pega 7, which would give them a whole raft of new functionality. Customer maintenance requests include any non-financial transaction that a customer may request, such as an address change, which may be fulfilled either manually, semi-automatically, or automated based on Pega business rules. They’re measuring the ROI primarily in terms of improving efficiency (increased throughput, reduced processing time, reduced paper) and improving quality and regulatory compliance (reconciliation of work received and processed, data capture validation, identification of trends, better reporting to compliance). He did mention the improved customer experience, although mostly in terms of the call center/branch staff rather than the actual customer, but turned that back to branch efficiency and productivity. 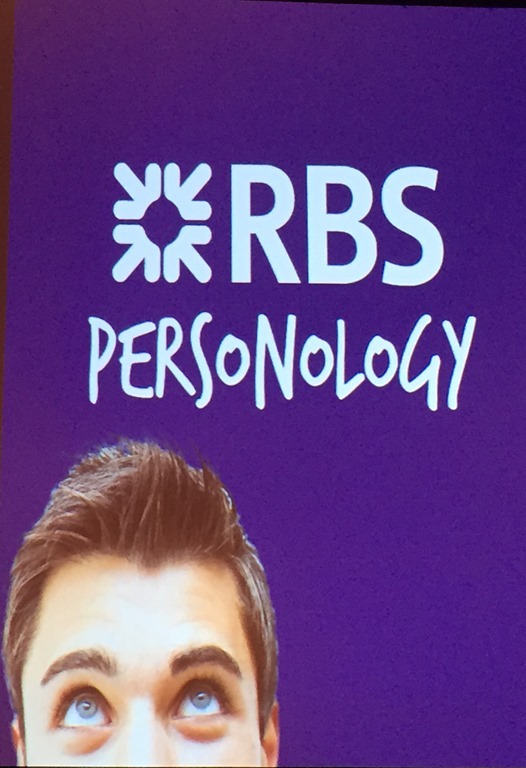 There was a mention that this would result in lower wait times for customers while they were in the branch making the request, but this is so far out of touch with the realities of customer experience these days, as evidenced by the keynote that we saw this morning with AIG and RBS. This was (I think) a technical presenter from TCS going through this part, but depressing in the lack of awareness of how far they are from understanding the customer journey. This is one of the dangers in treating internal stakeholders as the customer rather than having an awareness of the actual customer and their requirements: the internal operations customer is mostly motivated by improving efficiency and compliance, not making sure that their real customer isn’t walking out the door and goes to a bank that pays attention to their needs. We can’t throw away the concepts of efficiency and compliance, but I find in dealing with my banks (yes, more than one, because none of them give me everything that I need) that there are still too many processes that require my presence in a branch, a physical signed document or a call to a call center, when they have already authenticated me in so many ways online already. They talked about their development process and some of the best practices and lessons learned: allowing time for visual screen mockups during inception in order to reduce rework later (they seriously didn’t know that? ), participation from other groups such as application integration (?! ), and including a Pega deployment architect to make sure that things get into production the right way. TD Bank has been using Pega for about eight years, and they seem to be rooted in older versions and older development methodologies. Definitely in need of some digital transformation. I didn’t attend this session with the goal of poking fun at TD or TCS, but this is really an example of old-school (probably waterfall) development methods that is not going to give them big wins in the long run. It’s clear that there is very deep integration with their other systems, and a lot of use of the Pega CPM framework and rules, but also that there has been a lot of custom work here: PRPC used as an application development tool. This is pretty typical of what I have seen with Pega customers in the past, although their recent shift to providing applications rather than frameworks is an obvious strategy to move to less-customized solutions that can be deployed faster. For the customers still plugging away on 6.x, that might be more of a dream than reality. After the futurist view of Brian Solis, we had a bit more down-to-earth views from two Pega customers, starting with Bob Noddin from AIG Japan on how to turn information that they have about customers into an opportunity to do something expected and good. Insurance companies have the potential to help their customers to reduce risk, and therefore insurance claims: they have a lot of information about general trends in risk reduction (e.g., tell an older customer that if they have a dog and walk it regularly, they will stay healthier and live longer) as well as customer-specific actions (e.g., suggest a different route for someone to drive to work in order to reduce likelihood of accident, based on where they live and work, and the accident rates for the roads in between). This is not a zero-sum game: fewer claims is good for both AIG and the customers. Noddin was obviously paying close attention to Solis, since he wove elements of that into his presentation in how they are engaging customers in the way that the customer chooses, and have reworked their customer experience – and their employee and agent experience – with that in mind. Delight your customer: target their needs and wants based on what you know about them, using the channels through which you know that they can be reached. He discussed how to use Pega solutions to achieve this through data, analytics and decisioning; obviously, the principles are universal. It’s about the conversation. If you focus on doing the right thing for the customer, not always explicit selling to them, you build the relationship for the long term. One customer, one bank. A customer may have products in different bank divisions, such as retail banking, credit cards and small business banking, and you need to be cognizant of their complete relationship with the bank and avoid internal turf wars. You can do a lot with a little. Data collection and analytics technologies have become increasingly cheaper, allowing you to start small and learn a lot before expanding your customer analytics program. Alan Trefler closed out the keynote before sending us off to the rest of the day of breakout sessions. 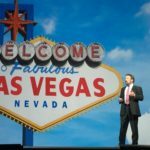 Next years, PegaWorld is in Las Vegas; not my favorite place, but I’ll be back for the quality of the presentations and interactions here. These two keynotes this morning have been great to listen to, and also closely aligned with the future of work workshop that I’m doing at IRM BPM in London next week, as well as the session on changing incentives for knowledge workers. Always good when the planets align.